The Greenport IGA seems normal enough from this Google Maps street view from 2012. Any seasoned supermarket expert will tell you right off the bat this is an A&P Centennial model, and they'd be right. That's not the mystery here. Here's a close-up of the storefront taken by a family member. Seems average enough, right? Take a look inside through those windows. First of all, that Customer Service sign looks like it belong in an Acme Theme Park store, not a small IGA. (By the way, it's not from an Acme Theme Park store. Does anyone recognize it? I'm not too familiar with Long Island supermarkets, but it could be Waldbaum's or King Kullen, neither of which I know well.) But take a closer look at the signage on the walls. You might notice that this picture actually shows more than the original. That's because I cropped out the person standing in front of the store, and the subject of the photo. You might be wondering: what the heck does this have to do with anything? Be patient! Let's head about 90 miles to the northwest to the small city of Beacon, NY. 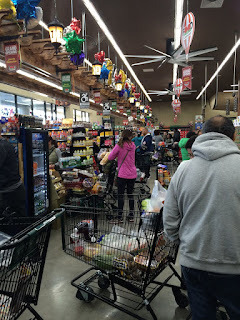 Now is as good a time as any to give a full tour of the Beacon, NY Key Food Marketplace, owned and operated since 2008 by Zayed "Junior" Dabashi, who lives in Beacon. Dabashi did a renovation when he first bought the store in 2008 but the store is currently undergoing a more extensive renovation with new fixtures, more upscale offerings, and a new floor. I make it a point to pick up a circular at every supermarket I visit. For one reason or another, I completely forgot here! The deli (with its original Grand Union wood paneling behind) is immediately to the right when you enter. The new flooring is visible in these pictures, as well as the new produce bins. I believe the deli sign and awning are left from the 2008 remodel. Okay, not quite with that "fresh produce" sign. In their defense, the produce is immediately to the right of the red service doors you can see here. The first grocery aisle, with new aisle markers but no new floor yet. 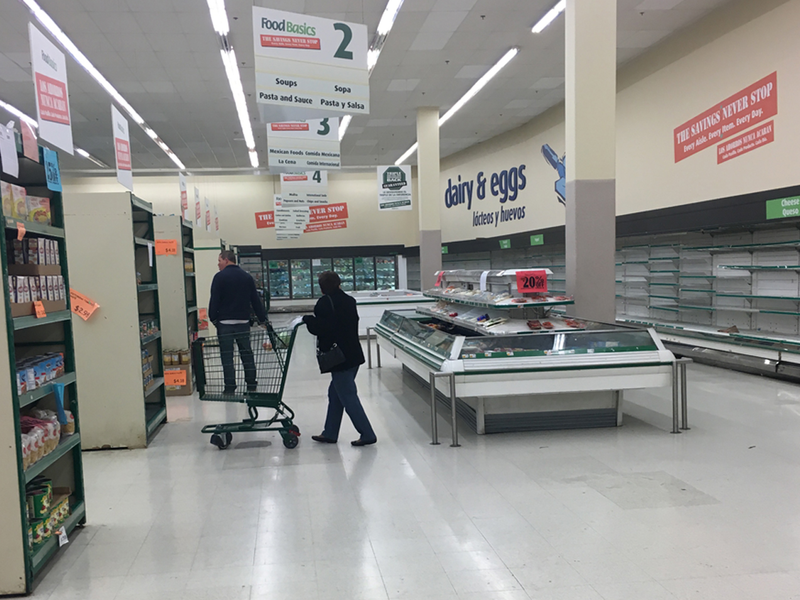 The eighth, and last, aisle with frozen on the left in brand-new cases and dairy on the right in older cases. The new floor has been installed here. The last aisle looking towards the back of the store. The front left corner with baked goods and dairy. This store is too small to have a bakery. Notice this corner no longer has new flooring. Before we head out, here's a picture of Dabashi, left, with Bob of Bob's Red Mill, right. This was hanging above a large display of Bob's Red Mill products. A shot of the entire property, with Beacon's main street to the right. Now, let's take a look at that decor put in, in 2008. Key Food Beacon, left, Greenport IGA, right. Notice that both stores have the same decor package, exactly. Although the Key Food says "Baked Goods" on the sign, and the IGA says "Fresh [something, presumably 'Baked']", the sign, wall color, and patterned wallpaper are identical. Okay, now you're seeing a pattern. Same decor, same signs, same color scheme. Here's where the mystery comes in. All of these stores were last renovated between 2005 and 2010. All have exactly the same decor package but none overlap or ever overlapped owners. Was this decor package sold as a "stock" decor package? That's the only explanation I can think of. Any input would be appreciated! Around 1992, Waldbaum's (which had been bought by A&P at that point) built a brand-new store, complete with an underground parking garage, on a site that previously was a two-story Two Guys hypermarket. The introduction of Waldbaum's into New Jersey was a flop, and became an A&P Foodmarket. By 2002, that had failed as well; A&P converted the store to its Food Basics banner, for which it had high hopes. More than anything, it is rumored that the key benefit of Food Basics was the ability to lay off skilled employees (like meat cutters and bakers - who are obviously paid more), since all food preparation was done off-premises. Images from Acme Style blog. Click to read more about this store and see more pictures. 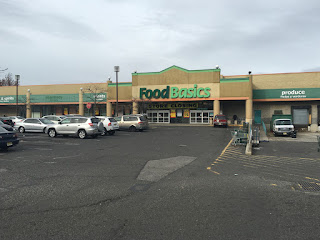 This Food Basics was reasonably successful but had to be refined over the years, when A&P did everything from adding a "dollar-store" aisle with general merchandise to actually reducing sales floor space. The Food Basics made it all the way to the end, closing in November 2015. 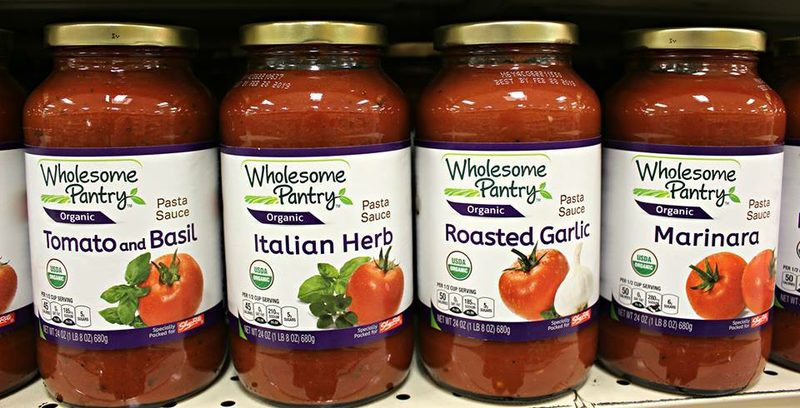 The North Bergen facility was purchased by Brooklyn-based Bogopa Service Corp. in A&P's bankruptcy, an ethnic operator which owns the Food Bazaar chain. 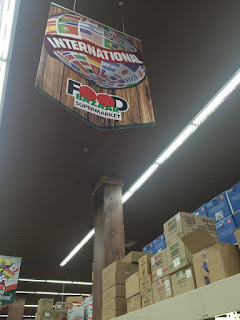 Food Bazaar had a store in West New York, NJ since about 2005. Image from Food Bazaar Supermarket on Yelp. Although it is a very small store, the West New York Food Bazaar is a very nice and well-maintained store. 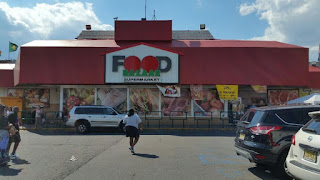 The North Bergen Food Bazaar was a round-2 conversion for Food Bazaar, coming several months after Elizabeth, NJ; Brentwood, NY; and 163rd, Bronx, NY. The Fairview Food Bazaar, which was supposed to open on November 10 but is now opening on December 1, is also a round-2 store, while the store at 11110 Flatlands Ave in Brooklyn is a round-3, opening next spring. In his grand-opening speech, Bogopa Service president Spencer An said that the North Bergen store actually opened ahead of schedule, which never happens, because of the demand in the area for the new store. Almost to the day, about a year after the store closed, the new Food Bazaar opened. I visited the store for the first time earlier today. It is beautiful! There are absolutely no remnants of Food Basics left behind. Not the carts! Not the floor! Not the shelving! Not the lighting! The parking lot was also repaved. As you can see in Acme Style's picture above, the lot was in pretty awful condition before. 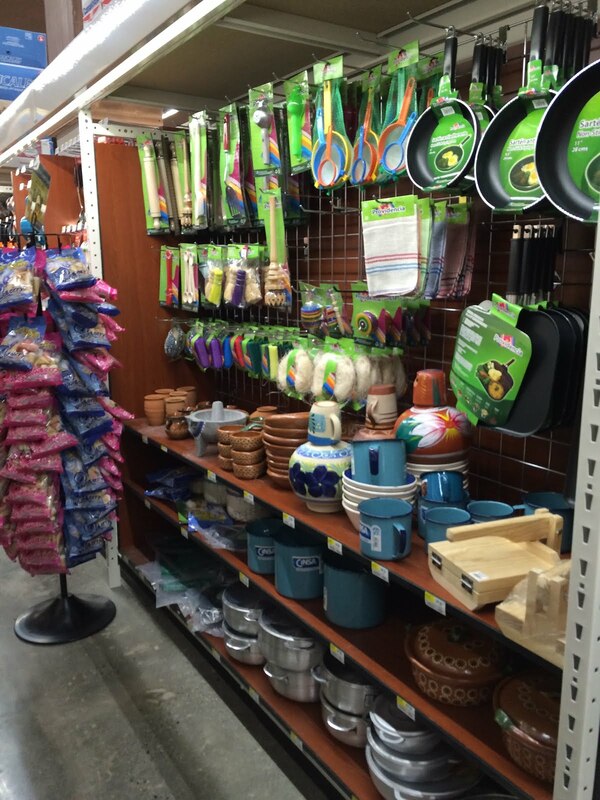 Food Bazaar is one of those stores that uses every inch of available space, inside and out! When you walk in, this is the first thing you see. The produce, meat, and seafood departments are under a lower ceiling to the right. Produce looking towards the entrance and floral. Looking back towards the entrance from produce. Looking into produce towards the entrance from seafood, which is directly behind produce and in front of meat. Looking back towards meat and seafood from the entrance. Okay, I take that back about their reuse of Food Basics elements: that banana shelf might be a repainted Food Basics produce display! Fruits, vegetables, juices, salad dressings - but strangely enough, only huge bags of carrots! Moving towards the back of the store, we see seafood and meat. Unfortunately I don't seem to have gotten a picture of the seafood counter, which is a shame because it's huge. Now we head along the back wall of the store. 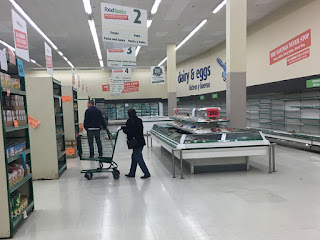 There is an aisle going along the back of the store with dairy (cases on both sides), then on the back of the dairy cases facing the back of the store is sale items. There are maybe two or three international aisles. And they are REALLY international. Foods from just about everywhere - authentic foods that actually come from those countries - can be found in their international selection. Because of the area's demographics, a large part of the international section is dedicated to Latin foods, but eastern Europe, Asia, and Africa are also represented. Aside from that, the grocery aisles are pretty standard. Image from ShopRite of Newton's Facebook page. My own image from the North Bergen Food Bazaar. I'm sure the similarity in branding is a complete coincidence. Moving on... along the back wall in the corner opposite the entrance is milk and bakery/deli. There is a large selection of fresh-made cakes and pastries, with a fresh bread counter just past this. The deli section includes a hot food counter. Along the side wall, there is a liquor department coming soon. 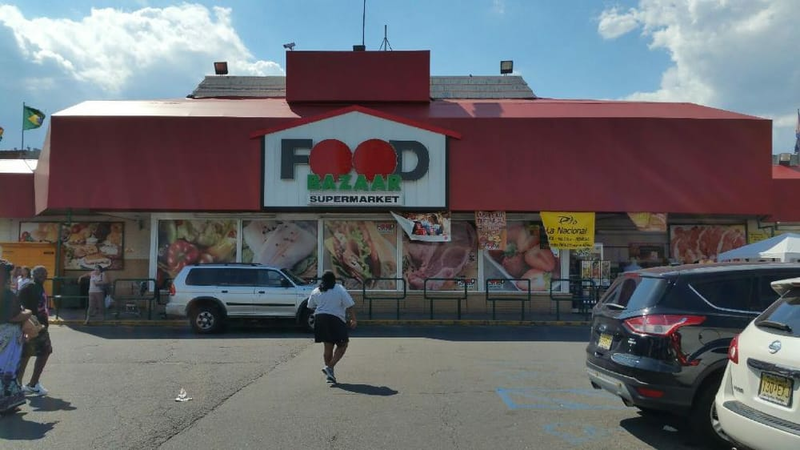 New Jersey liquor laws require that a corporation can only own two stores selling liquor within the state, and this is Food Bazaar's first liquor-selling store in New Jersey. I don't know if Food Basics sold liquor. When it opens, the liquor department will become the last aisle of the store. The frozen food aisle is not quite the last aisle, but a few in. It would have been in the same place when Food Basics operated here, but since Food Basics' store was smaller, it would have been the last aisle. The lines were quite long today. I hope that's a sign that they are doing well. You can almost see in the top right corner here, a huge partial barrel suspended from the ceiling over the future liquor department. It's a cool decor feature. There were three of these huge, modern ceiling fans over the front-end. This picture doesn't quite capture how large they really are. Here you can also see the ceiling has been painted dark brown, and the lighting has been switched to LED throughout the store, like in Elizabeth. I don't think it's even necessary to compare the new Food Bazaar to Food Basics. It's so much nicer and sells higher-end things like organic produce, fresh bread, and hot food that Food Basics would never have considered selling. Although the wait here for people in the neighborhood was long, I believe the new store was well worth the wait. 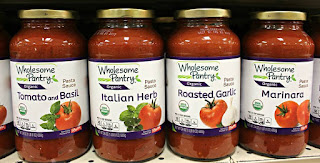 Has anyone else been to the new Food Bazaar of North Bergen? Did I miss anything? Let me know what you think in the comments!